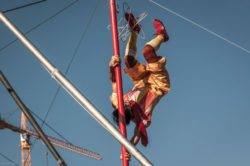 Circus Bella is a full-force, non-stop 60-minute kaleidoscope of thrilling feats of balance and strength, elegance demonstrations of grace and poise, and outrageous humor of slapstick antics. In 2018, they celebrate their 10th anniversary season. The circus showcases static trapeze, rope walking, a 9-person juggling act, contortion, hula hoop, original clowning and more. The mission of Circus Bella is to create a one-ring circus that uplifts diverse audiences, engages community, and challenges its artists. They put homegrown circus back into the ring, creating productions that are accessible, festive, and inspiring. Feel free to bring picnic blankets and small folding chairs to all locations. Circus Bella does not provide audience seating at events. Performances run approximately 60 minutes.